Visit the Lyft Hub in Seattle for your vehicle inspection and/or help uploading your documents. Click here to see the days and hours for the inspection locations. Make sure your vehicle is inspection-ready! To save time, please check that it is cleaned out, all lights work, and ensure that your car has a spare tire and jack. If you cannot make it to an inspection, you may visit one of the mechanics listed here and have this inspection form completed. Inspections typically cost around $50, but can vary depending on the facility. We recommend calling ahead to confirm price and availability. Already an approved rideshare driver in Seattle? Go to your Dashboard or app to upload the required documents, or bring them to The Hub. Bring each of these documents with you to the Hub, or take photos of each and upload them in the Dashboard. Drivers are required to have a valid driver's license issued in Washington. A temporary license is acceptable, but be sure to upload your permanent copy when you receive it. Active duty military applicants and their dependents can have an out-of-state driver's license and vehicle documents. Visit your local Lyft Hub and a Lyft representative will help set up your driver account. Drivers are required to upload a copy of their vehicle registration. It must be issued in Washington, unless active duty military. After you've been approved as a driver, we will help you obtain a TNC Decal and For-Hire Permit. 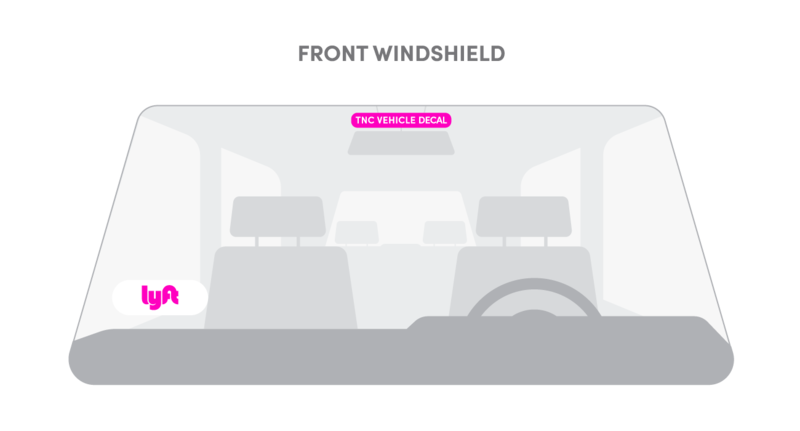 Your TNC Decal should be placed on the inside of your front windshield, behind the rear view mirror. Carry your For-Hire Permit and display your TNC Decal with you at all times while operating as a Lyft driver. Failure to do so may result in citations.